Build powerful and fast applications with F#About This BookExplore the advanced concurrency support in F# and .NET TPLCovers major optimization techniques in F# to improve the performance of applicationsUse Struct, Class and Record model, Interop with C# and VB without sacrificing performance.Who This Book Is ForThis book is for F# developers who want to build high-performance applications. Knowle… dge of functional programming would be helpful.What You Will LearnUnderstand how the execution of functions in F# worksIdentify common performance bottlenecksImplement best practices to optimize performanceUse the available tooling to help measure performanceCombine the best practice of asynchronous and synchronousOptimize further using various F# language constructsIn DetailF# is a functional programming language and is used in enterprise applications that demand high performance. It has its own unique trait: it is a functional programming language and has OOP support at the same time.This book will help you make F# applications run faster with examples you can easily break down and take into your own work. You will be able to assess the performance of the program and identify bottlenecks.Beginning with a gentle overview of concurrency features in F#, you will get to know the advanced topics of concurrency optimizations in F#, such as F# message passing agent of MailboxProcessor and further interoperation with .NET TPL. 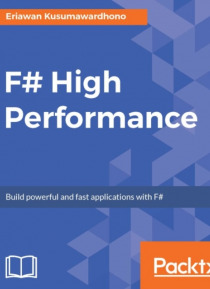 Based on this knowledge, you will be able to enhance the performance optimizations when implementing and using other F# language features.The book also covers optimization techniques by using F# best practices and F# libraries. You will learn how the concepts of concurrency and parallel programming will help in improving the performance. With this, you would be able to take advantage of multi-core processors and track memory leaks, root causes, and CPU issues.Finally, you will be able to test their applications to achieve scalability.Style and approachThis easy-to-follow guide is full of hands-on examples of real-world multithreading tasks. Each topic is explained and placed in context, and for the more inquisitive, there are also more in-depth details of the concepts used.